Volkswagen is calling their XL1 Concept the most fuel efficient car in the world and while there is no guarantee that the production version will retain the exact drivetrain from the concept, the XL1 that debuted at the Qatar Motor Show is powered by a 0.8L litre, two-cylinder turbo diesel aided by an electric motor/lithium ion battery pack and a 7-speed dual clutch transmission. This drivetrain installed in the slippery yet distinctly modern VeeDub styling affords the XL1 an amazing 261 miles per gallon. It should be pointed out that the fuel economy of the VW XL1 is not official per the EPA but just from the automaker. However, should the production version of the XL1 come anywhere near 261mpg it will very easily exceed any vehicle available in the US auto market and according to the German auto site Automobilwoche it is on its way. Automobilwoche has reported that Volkswagen will build 100 units of the XL1 diesel hybrid with the initial units being sold in the domestic German market. After the initial wave hits Germany, the United States an booming Chinese industries will get their hands on very-limited units of the new VW hybrid and should that happen, Volkswagen Auto Group will have a huge advantage over the other “green” vehicles currently leading the US market. Should this super-efficient Volkswagen XL1 diesel hybrid actually make it to production and do well in those three markets, imagine what adding things like plug-in technology could do to the mpg ratings. This new car would certainly have a massive impact on the auto industry and the ball is in VW’s court to actually get the car on the road. 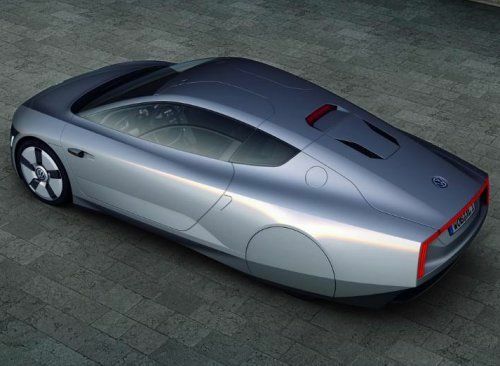 Click here for a more in-depth look at the new VW XL1.